All Things AmeriCorps | Getting things done for America! This AmeriCorps page is no longer active as of April 18, 2017. Please get AmeriCorps updates and news by following @RIAmeriCorps on Facebook! Or to get more information about volunteer listings serve @RIVolunteers on Facebook, Instagram, or Twitter! One of the ways racism is plaguing our country is through our unequal education system. The Learning Community drew me to want to pursue the Middle Grades VISTA position because I wanted to observe the many reasons why the school was so successful given that they had the same demographics of students as surrounding schools. I learned one of the biggest goals we have at The Learning Community is supporting our families and students in all aspects of life inside and outside the classroom. One project that I completed, as a Middle Grades VISTA, was researching summer program opportunities available to our families across Rhode Island. This was an important project to take on because most of our families are low-income and it can be financially hard for families to send our students to summer programming. Secondly, students who attend summer programs tend to retain academic information better over the summer months than students who do not attend. At first glance, this opportunity seemed like a quick internet search and an excel spreadsheet. But after a few days, that mentality quickly changed. I created a binder full of resources including scholarship applications, registration forms, and various program logistics for over 400 programs in Rhode Island and Massachusetts. The next step was figuring out how to present this overwhelming amount of information to our families and students without sending them home in emotional turmoil. Along with help from staff in the school, I planned a summer opportunities fair showcasing all of our information. I contacted over 60 program providers in hopes that they would attend. 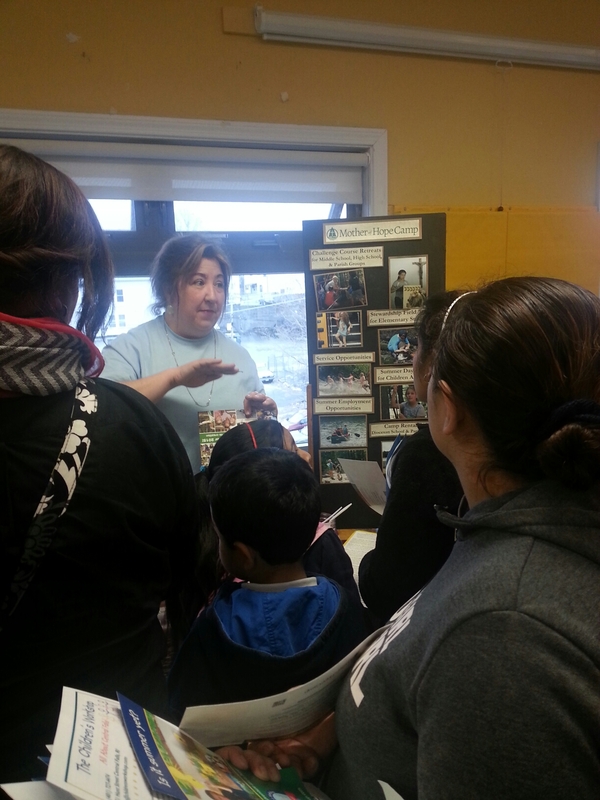 Fifteen providers showed up that night to present their programs to our students and families and over 200 families attended. It was a huge undertaking, but an even bigger success. I know that it can be difficult as a VISTA sometimes to see immediate results, but this is one example of what hard work and dedication can bring to the table. I am still pleasantly surprised to recall, on my daily commute to work, so many fond memories of my years as a Classical High School student. During those years, I worked as an office receptionist after school and on the weekends. Junior year, we were assigned a re-usable energy project in my AP Environmental class. I quickly realized that I was not a very good environmental steward. It became apparent, neither was the office I worked for. Well, I thought, “Challenge accepted!” I took it upon myself to bring it up to the Office Manager, confident she would see the error of our ways and change some of the methods we had in place. At the time, recycling was considered a radical advancement in the office; one that I supported with the utmost conviction. After my well-rehearsed “impromptu” declaration of why paper recycling should be put in place, she smiled tenderly at my passion and responded that while she’d like to rid the world of all its toxins, recycling would never work unless everyone decided to get behind it. And that my friends is when I realized how important it is to make the big decisions for yourself first, because even the biggest movement started at one point with a small few. A few years ago now, Serve Rhode Island’s Executive Director, Bernie Beaudreau, was walking through the park and wondered about how great it would be for groups to clean up this by-all-other-accounts beautiful park. Seven years later, groups of community members including AmeriCorps members, politicians, legislators, neighbors, families, college students, youth, and adults of all ages are still coming together on a Saturday morning to clean up their neighborhood park. According to the Environmental Protection Agency, environmental stewardship is the responsibility for environmental quality shared by all those whose actions affect the environment and as a means to a more sustainable future. As an AmeriCorps VISTA at Serve Rhode Island, I have had the pleasure of seeing how much good one group can do and the movement it can set in motion. I plan to continue these efforts even after I’ve completed my term, as so many others have, some of whom I met at this year’s cleanup and hope to continue to run into in years to come. Along with taking care of our community parks, we are building up our AmeriCorps garden, giving way to environmental stewards and community leaders alike every day. Proud Classical alum? Clearly. AmeriCorps lifer? Can’t wait to find out….! As the Family Engagement VISTA at The Learning Community Charter School my primary role is to improve the systems for family engagement and to create and implement new systems. As a VISTA it’s often easy to lose sight of the bigger picture, to get lost in the details of your work and not be able to see the impact that your work is making. I was drawn to doing a year of service for AmeriCorps because I wanted to be a part of something meaningful after graduation and before pursuing a graduate degree. No matter what, I knew I wanted to take a year before going back to school, to make some sort of impact, rather than just working a normal 9 to 5 job and going through the motions. Working in close proximity to other AmeriCorps members whose roles are focused on direct service, I’d be lying if I said I never compared my work with theirs. There were times early in my year of service when I would compare the easily visible and quantifiable progress they were making with students with all of the projects I was working on, and wonder if what I was doing was making any difference. Some days I would get bogged down in that mindset, questioning the impact of all that I was doing, but when I took a step back I began to realize just how much I was actually making an impact. Though my project of collecting student and parent birth information seemed tedious, once I took the time to ponder what that information would lead to, the importance of my role became clear. Not only will this work lead to our faculty and teachers having a greater understanding of the demographics of our families, it is also currently being used to implement a series of meetings with the entire school team to learn more about the families, and help engage more families in each classroom. This project has already had amazing results; demonstrating the incredible diversity of our school–we have families from a total of 31 different countries–and also demonstrating the diversity of each classroom. Despite these revelations, I know that there may still be days when I wonder, but I have also come to realize just what I need to do to remind myself of the importance of my position; take a step back, look at the bigger picture, and remember that even small changes can make a big difference. At the beginning of the year, I began observing Kindergarten Response to Intervention (RTI) groups, knowing that I was to eventually have a group of my own. 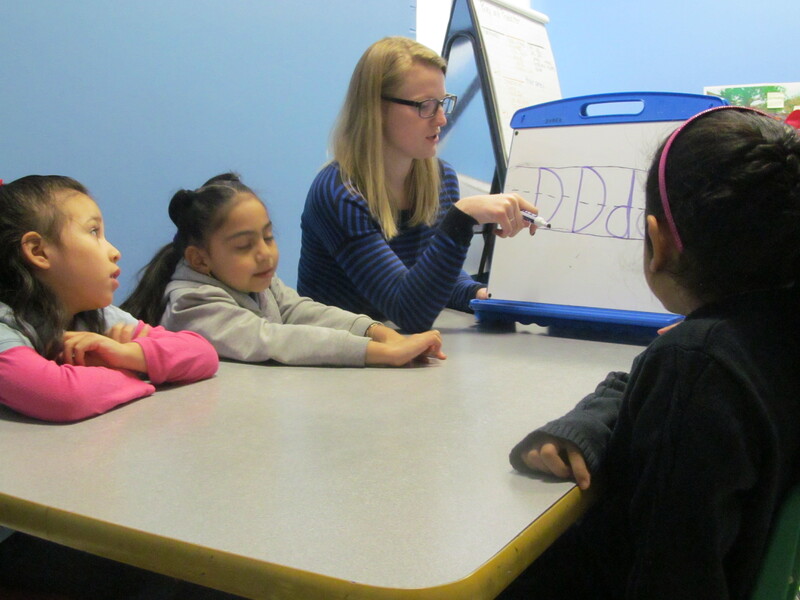 RTI groups, I learned, are for students who are just below the reading benchmark to give them small group attention and support to boost their reading level. I spent each of these observations hidden in my notebook, writing down every detail that I could possibly cram in during the lessons. I was both terrified and excited to have my own group. Just a few weeks later, I had my own group. As I looked at the four Kindergartners sitting across the table from me, my heart beat fast. How would I help to instill language in these students – and what if I hurt them more than helped them? I had certainly never done anything like this before. I followed my notes as best as I could, but what I soon realized is that teaching requires way more than a few scribbled pages of notes. My notes could not help me figure out the correct way to keep Danelis from shouting out every answer before her classmates had a chance, or how to get Jennifer to be more confident in her answers. As weeks turned into months, my four Kindergartners and I had become something like a family. During our half an hour together, we counted words, retold stories and practiced rhymes and letters. Although the beginning of the year had seemed slow, suddenly our family knew all 26 letters! However, something still felt daunting to me. How would these seemingly small abilities, turn into reading? Eventually I decided that it was time to try a book, even though I was terrified of how it would go. Each book had some words we had been practicing on the cover. I took a deep breath and handed them out. Before I could even begin introducing the title, Jennifer pointed to one of the words and said “Look! Was!” I let out my breath and smiled. They truly had been soaking in all of our lessons and they were ready to read. At the beginning of the year, I was so afraid of hindering the learning of these students. Soon I realized that the students had many teachers besides me: their classroom teachers, families, and the world around them, and most importantly themselves. The students had worked hard to soak in all of the information and had desired to learn. It felt amazing to be a part of something as essential as a student acquiring language. Here at The Learning Community, students are given many opportunities. The school has worked to build a great sense of community among students, teachers and families, and we explore together what it means for our community to be reaching for a common goal. 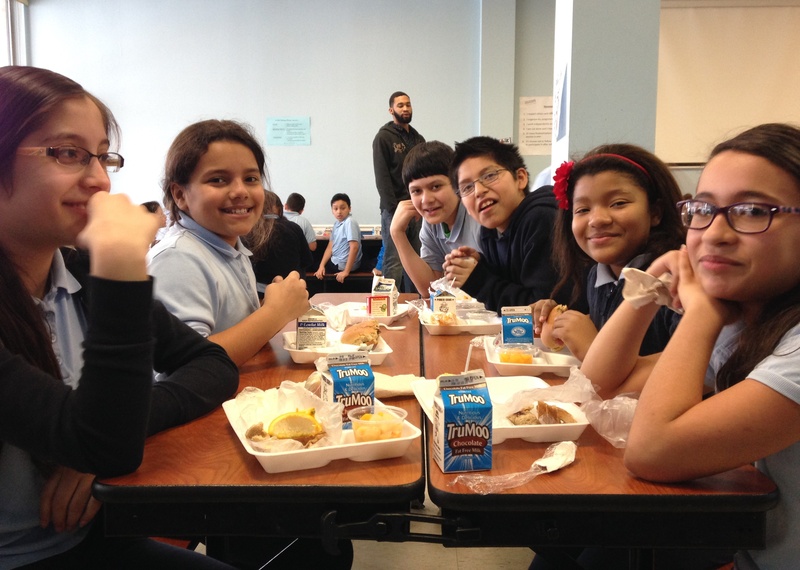 Students are offered free breakfast, lunch and a snack every day at school. I feel this is key for our students to be able to focus and learn throughout the day. The students also have a choice to get dinner in our after school program to help them stay focused and get through their long days at school. Another great way our school shows economic opportunity is our dress code. All students must wear brand-free clothing and if they do not have access to such we provide them with dark blue pants and light blue shirts. Students must wear the appropriate uniform to school every day. This eliminates any kind of favoritism, or even bullying because of what a student is wearing. There is no debate on who is the “cool kid” because of what a student is wearing. Our school does a great job giving each of our students the same economic opportunity and I’m so pleased and honored to be a part of it. Here is a picture of some of our smiling faces during lunch time!